It has been almost six months since we introduced the Beat Writer concept to 10,000 Birds. Since then there have been some major changes here at the ol’ blog and we thought it was time to update everyone as to where we are at with this grand experiment in group bird blogging. After all, if you, our regular readers, don’t know who is where what hope has a random new visitor of figuring it all out? Our Beat Writers and their schedule can be found right here but don’t go clicking through just yet – there is exciting news to share! We would like everyone to give a warm welcome to the newest addition to our excellent roster of talented beat writers. 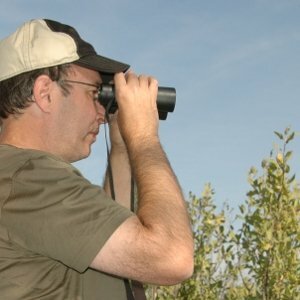 We at 10,000 Birds are excited to introduce Greg Laden, who will be familiar to anyone who pays attention to nature blogs because of his perch near the very top of the Nature Blog Network. Greg brings a lot of great traits to the table and we can’t wait to see his posts every fourth Thursday on Bird Evolutionary Biology. His brief bio is below and the non-sequitur of a final sentence should give you some idea of how well he will fit in here at 10,000 Birds. Greg Laden has been watching birds since they were still dinosaurs, but has remained the consummate amateur. This is probably because he needs better binoculars. Based in the Twin Cities, Minnesota, Greg is a biological anthropologist and Africanist, who writes and teaches about Evolution, especially of humans. He also blogs at Scienceblogs.com. Greg’s beat is Bird Evolutionary Biology. One could say that knowing the science of birds can make the birds more interesting. But really, knowing about the birds that go with the science is more likely to make the science more interesting. And thus, birding and Neo Darwinian Theory go hand in hand. Darwin was, after all, a pretty serious birder. Greg has seen a bird eat a monkey in the wild. We’d also like to say a sad farewell to those Beat Writers who, for one reason or another, no longer write at 10,000 Birds. Patrick, Christopher, Rick, James W, and Robert will be missed, though you can still track them down if you want to read their material. Check out our page of ex-10,000 Birds bloggers to see where. You have gotten 10,000 Birds to a place we couldn’t even have dreamed of six months ago and every day we can’t wait to read the blog to see what you have posted. One hundred happy points for each of you! Here’s hoping the next six months continue the success and great blogging of the first six months, that Greg fits in as well as we all think he will, and, most importantly, that we all get out and see some great birds! Welcome Greg! Don’t drink the water and you’ll be fine! Can’t wait to see some of Greg’s posts! And never disagree with Corey or Mike unless you enjoy the sound of a whip. But apart from that … welcome to the fun ride. @Jochen: Shhh! You’ll scare him off! @Corey: oh, you mean he isn’t in chains yet? @Jochen: We haven’t chained anyone since that unfortunate incident with the woodchipper. Hi Greg, we already have a sweepstake going for your happy points/demerits total for May. Want in? Where Are You Birding This First Weekend of May 2015?